I’ve been on a huge Doctor Who kick lately. So, when I ordered my new iPhone a few weeks ago, I knew that I needed to make a seriously geeky case to celebrate my love for both David Tennant and my shiny new phone. 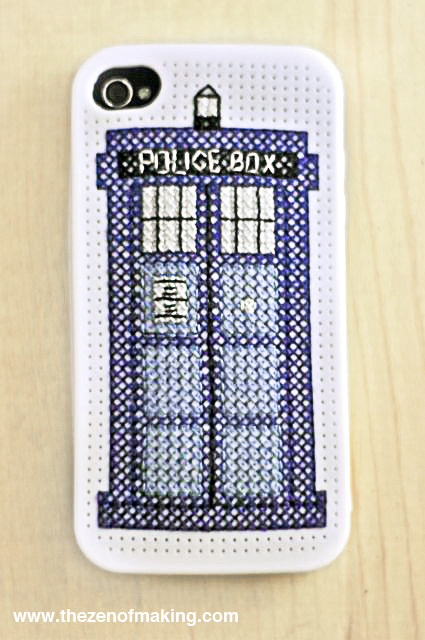 So, I did what any reasonable girl would do: I bought a cross-stitch iPhone case and designed a TARDIS cross-stitch pattern! Want to stitch one of your own? Here is an up close look at the detail work in the pattern. 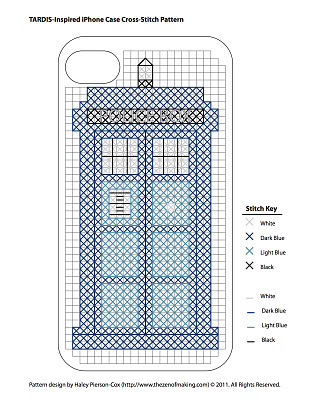 Please note that some of the lines in the windows, the sign, and the “Police Box” lettering are stitched off of the grid and create extra holes in the case.  (The case is soft—you can stitch right though it.) If you don’t want to alter the case, you can replace the lettering with white Xes and move the window lines and sign lines to fall over existing holes. If you have trouble downloading the PDF, feel free to send me an email. Thanks so much for sharing. I am sure it's bigger on the inside. No problem! Feel free to email me a photo if you use the pattern. This is brilliant – Thank you!This is definately going to be made for my brother in law for christmas! This is very, very cool. thanks for sharing it. I have saved the pattern and hopefully I'll have a reason to use it when I have a chance to update my current iPhone. Fantastic! My daughter just got an iphone and is a huge doctor who fan. I am doing this for a Christmas gift! Awesome! Definitely feel free to send me photos if you do–I'd love to see other people's versions. I must buy this case now! 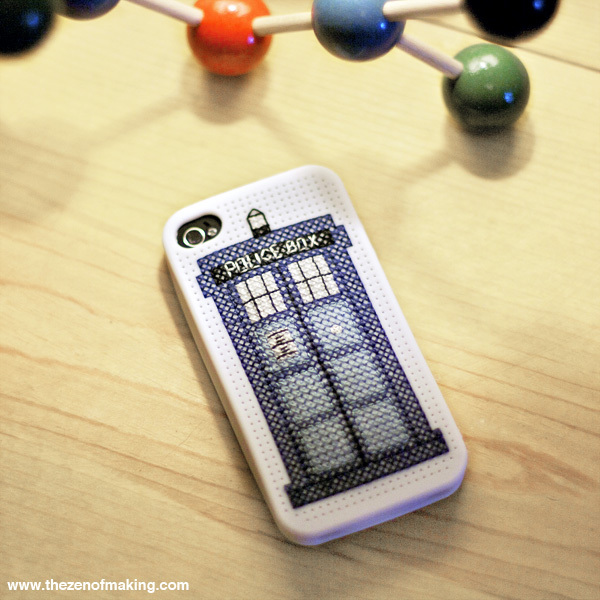 I want a neato TARDIS phone case!! I just completed mine! Thanks for the amazing tutorial. I have 1 question, (this is my first cross-stitch attempt) My case is warped now, it's not laying flat & has rippled a bit. Any suggestions? Did I do it too tight? I'm glad you liked the pattern! As far as the warping, it does sound to me like it's a bit tight. You can try stretching it a bit by running a mild detergent and water over it, rinsing it completely, then pressing it flat. (If you have something heavy to keep it flat while it's drying, that's even better.) Good luck! Thanks so much for the quick response! I'll give that a try. It's such a lovely tardis I cringed then I thought I might have to start all over! No problem. I had the same issue the first time I stitched it, and weighing it flat while drying was definitely key. I hope it works! I used your pattern, I made this….Love it. Thank you. I love it. I love you. I'm pretty sure you're my favorite. I want to live on your blog. Can’t wait to make this but think I will frame it instead. I adore this so much! I just bought my frist iPhone cross stitch case & I’m planning to use your pattern for it. Can you tell me the specific floss colors you used? Fab pattern- thanks! I’m gonna try it in metallic blue threads to see how it comes out! Super excited!! !